"AAAGGGHHH!!! THE 'TECHNICOLOR'! I'M BLIND! Someone turn down the contrast! Danny Kaye's golden locks are burning out my retinas!" "We're gonna remake 'Titanic'! I don't think that well's dry yet!" At any rate, this version was hatched as a vehicle for Mr. Danny Kaye. He plays the title character Burleigh Sullivan, a dimwitted perpetually clumsy milkman. He's of the sweet but misguided variety, with an endless supply of nervous energy to go with his rubber-based face and joints. So be prepared for a lot of falling down and sundry other examples of the slapstick variety. I've said before that I've never been a fan of this sort of comedy, but when you sit down to watch a Danny Kaye film it's par for the course. Physical antics paired with an uncanny ability to perform tongue-twisting songs and monologues were Kaye's bread and butter for the better part of 30 years on the silver screen. Me: (singing) "Do you have any pa-per-clips?!" Me: (turning to the unseen audience) "YES! ANY PA-PER-CLIPS!!" So, I say, if you're going to do it, why not do it BIG. The more over the top, the better. West Side Story. My Fair Lady. The Pirates of Penzance. Grease. These are the type of musicals that I like. The one's that unashamedly have their characters suddenly breaking into song, whether it's during a knife fight or after getting stranded at the drive-in. And this is where I feel "The Kid From Brooklyn" has failed. Rather than having the characters break into spontaneous song, they use the old crutch of framing the musical numbers as night club acts or stage productions that take place during the regular goings-on of the story. I feel that rather than infusing the picture with a breath of fresh air and picking UP the pace, this has the opposite effect of bringing everything to a grinding halt. The narrative is interrupted so they can trot out Mayo's Polly Pringle singing a nearly petrified torch song. And Vera-Ellen as Kaye's sister gets two huge song-and-dance numbers. She's of the "tap-dancing sparkplug" variety of dancer, moving at a machine gun-paced clip. Sadly, rather than marveling at the gracefulness of her motion, I found myself grimacing with sympathy shin splints. Both women are accompanied by a troupe of dancing and singing women referred to in the credits as "The Goldwyn Girls", named for the head of the production company, Samuel Goldwyn, and chosen less for their performance talents and more for their physical attributes. This had the doubly daunting effect of being both sexist AND bringing down the quality of the musical numbers. Even Danny Kaye's usual vocal calisthenics are rendered ineffective, mainly due to how crudely they're shoehorned into the plot. The previously shy and retiring Burleigh Sullivan comes back from his cross-country conquests in the ring a changed man, full of confidence and bravado. While his "Hiya Doll!" attitude towards his gal Polly and jocularity with the press and public is understandable, his sudden monologue/song about a Russian ballerina named "Pavlova" (performed during a promotional dinner for the upcoming title bout) is so far out of leftfield, it borders on surrealism. Not to mention the fact that we have to wait until the 90-minute mark to see Danny Kaye "do his thing". But by this point, I was just praying for the end credits. As this is not really a boxing picture but rather a musical with a boxing plot device, the level of talent in the fighting scenes is nil. The fight settings with their massive crowds are the most impressive aspect. This was well before the days of computer-generated extras, so the only choice was to fill a room up with real live folks, which they did. But the actual fighting was played strictly for laughs. Even the supposedly "skilled" opponents that were taking a dive looked iffy. That brings us to Danny Kaye. While the "scrawny-guy-turned-boxer-winning-by-less-than-on-the-level-means" device certainly isn't a new idea (see here and here and, for that matter, every other boxing movie starring a comedian ever made...), it's brought to new levels of ridiculousness this time out. You see, the main weapon in Burleigh "Tiger" Sullivan's arsenal is, sigh.... ducking. That's what he's got going for him. He's really good at ducking. And this being the slapstick affair that it is, it's not just bobbing and weaving. No, Kaye goes into a full-body apoplexy, with the bending and the wiggling and the foot shuffling, which, by the way, was very reminiscent of a certain "Curly Shuffle" of Stooges origin. But that's neither her nor there. The bottom line is it's supposed to be goofy rather than realistic. And to that end it's a success. In the end, this movie has to be judged on the basis for which it was created. As a musical the dance numbers are stiff and the tunes are terminally uncatchy. 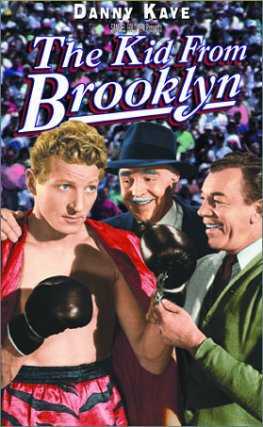 As a vehicle for Danny Kaye's specific physical and vocal talents, the framing boxing story is an uncomfy fit. And as a remake, it's not nearly as good as the original. So not only will this not appeal to fans of boxing movies, but musical fans are going to be disappointed as well. For that paper-thin cross section of Danny Kaye/boxing movie fans, you'd be better off with a "Rocky"/"The Court Jester" twin bill. * If you're like me (a product of the 70's and 80's, born well after when this movie was made), when you see Eve Arden you'll immediately start thinking, "Where have I seen her before?" I had to peek at her IMDb profile before I realized she was the principal from "Grease" and the ever popular and prosaicly named "Grease 2".